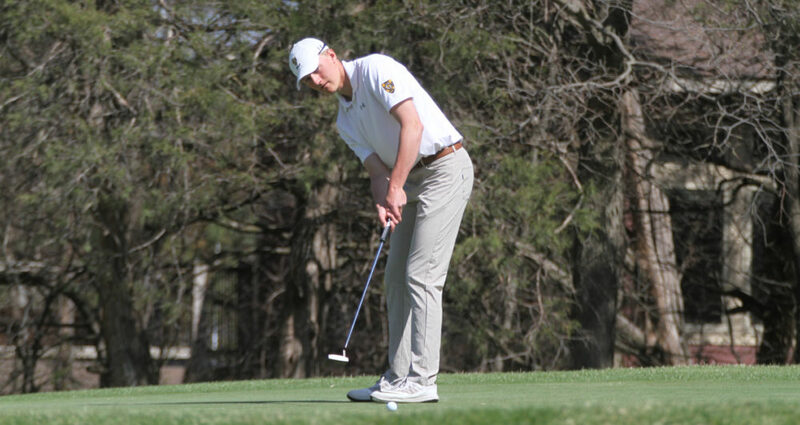 SARTELL, Minn. – The Gustavus men’s golf team finished play at the Saint John’s Invite on Sunday in second place. The Gusties score of 593 was just seven strokes behind the winner, Saint John’s. Max Ullan (So., Blaine, Minn.) had a very good day for the Gusties by shooting a 70 and earning himself medalist honors. Ben Hauge (Jr., Ramsey, Minn.) posted a 72 on day two and put himself in a tie for third place overall, while Jacob Pederson (Fy., Minnetonka, Minn.) shot a 77 and placed himself in a tie for fifth. Thomas Carlson (Jr., Plymouth, Minn.) also had a very good tournament for the Gusties, as he tied for 19th place. On Saturday, the Gusties will begin play in the MIAC Championship in Jordan, Minn.